Delectable key Lime avocado and pistachio ice cream. This simple delicious , velvety recipe will make the perfect summer time healthy dessert. ½ cup of maple syrup. Place the avocado, lime juice, and the 2 frozen cans of coconut milk into a food processor & blend until smooth & velvety. Add the maple syrup, & natural nut butter. Boil 50ml of water & whisk with the matcha green tea until a foam appears at the top. Allow this to cool & add to the ice cream mix. 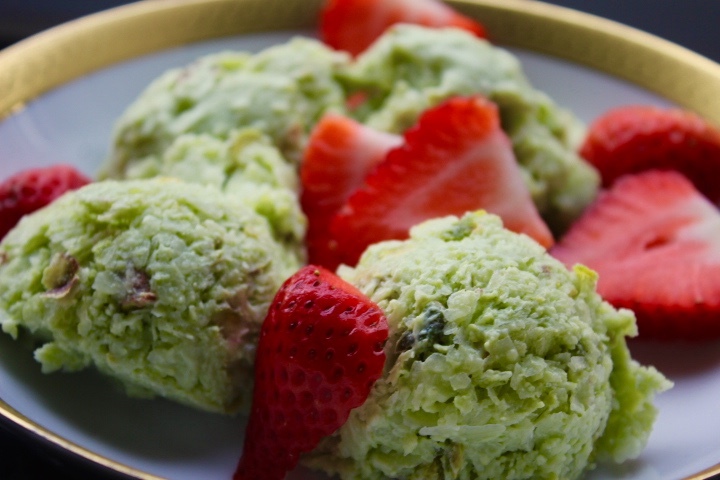 The pistachios can be either incorporated into the ice cream or added when served. Avocados are incredibly nutritious & packed full of essential vitamins & minerals including vitamin K, C, E, B5, B6, folate & potassium. They also contain magnesium, manganese, copper, iron, zinc, phosphorous, & fiber. Avocados contain monounsaturated oleic acid, which is a heart healthy fatty acid that is believed to be one of the main reasons for the health benefits of olive oil. Coconut cream has many health benefits, as it is anti-carcinogenic, anti-microbial, anti-viral & anti-bacterial. It is immensely rich in vitamins such as C & E. However it is important to be aware that the fat content of coconut milk is very high even though it is a much healthier than saturated fat & it can be metabolised by the body a lot more effectively. Matcha tea has many amazing health benefits. I often think of it as a step up to your standard green tea, because of its superpowers. It is loaded with antioxidants & it boosts the metabolism while helping to burn calories, & supports your bodies natural ability to detoxify. It is rich in chlorophyll & vitamins which enhance your mood & aids concentration. Additionally while delivering vitamin C, selenium, chromium, zinc & magnesium. Therefore supporting your immune system & helping to lower cholesterol & balance blood sugar.